Via Autobase Aichi we can report a new Takara Tomy Transformers Masterpiece MP-45 Bumblebee 2.0 Promotional Video & Designer Interview. The video was uploaded to the official Takara Tomy YouTube Channel and it features a several stop-motion animations of the new new Masterpiece Bumblebee 2.0 (a prototype) showcasing transformation, poseability, and comparisons next to the MP-20 Bumblebee. Additionally, we have the comments (Japanese audio only) of Bumblebee’s designer. He makes emphasis on the improves articulation and stability of this new mold. The video is region-blocked, but you can watch a mirror below and a complete gallery of screencaps after the jump. 2005 Boards member Galvatron1998 ig giving us the head up that some new Transformers Plushes have been Found At Dave and Busters in the US. These cute “chibi” style Transformers plushes were spotted at a crane game at a Dave and Busters restaurant. Galvatron1998 was lucky to grab the four characters available: Optimus Prime, Bumblebee, Megatron, and Grimlock. These plushes are different from the ones spotted in Australia some moths ago. Other 2005 Boards members let us know that they have found these plushes at cinemas and other locations, so you may try to look for them in stores to buy them directly. Check out the images attached to this news post and sound off on the 2005 Boards! Transformers Fans Hobby Master Builder MB-05 Flypro IN STOCK IN USA NOW! After the unexpected closing of Machinima’s YouTube channel, the trio of Prime Wars Trilogy shows: Combiner Wars, Titans Return, and Power of the Primes seemed to be gone for fans to watch them. Fortunately, the three seasons (including the 4 preludes) are now available for streaming via RoosterTeeth.com. The shows may not have been the best we have seen so far, but without a physical release there was no chance for new fans to watch and experience the series for themselves. A different format and storytelling which brought us the first animated appearance of Overlord and Victorion in a US cartoon and a different take on Megatron’s role in a Transformers story. Fans have now the opportunity to give the shows a chance and give proper feedback out them. Village Books Website has updated their listing for the upcoming Mazinger Z vs Transformers Manga/Comic with an image of the regular cover of this amazing crossover. The regular cover comes courtesy of Go Nagai, creator of Mazinger Z and one of the keystones of Japanese Mecha series. The powerful Mazinger Z shines in the background, and Optimus Prime is in front of him raising his arm as if he were initiating an attack. A very classic and retro style cover. We are sure fans of both franchises are really looking forward for this crossover. The planned publication date of this book is March 28, 2019 so stay tuned with TFW2005 for more details and information. Check out the cover after the jump and sound off your impressions on the 2005 Boards! Via Snakas blog we have information and details of the upcoming Transformers 35th Anniversary Exhibition”The World Of Transformers” In Japan. The event will be held at the Parco Musem in Ikebukuro from March 15th to Monday, April 1st, 2019. According to the Parco Museum website attendees could see many valuable materials such as toys and original art of the G1 era including invaluable wooden prototypes of the toys never seen before. There will a special “Bumblebee corner” to celebrate the Japanese premiere of the Bumblebee movie in Japan. A special pre-sale of “The Art Of Transformers Book” which contains a selection of packaging art of Japanese G1 and G2 toys. You will also receive a special poster by artist Hidetsugu Yoshioka for free, featuring G1 Optomus Prime and the new movie Bumblebee. A Transformers 35 Anniversary sticker. 1-Step Turbo Changers Optimus Prime and Bumblebee will be given away to school kids who attend the event while supplies last. Masterpiece Movie MPM-06 Bumblebee and MPM-07 Ironhide will be available for purchase at the venue. Several other goods will be sold like T-shirts, cups, keychains, bag and more. To top it all, you can also visit the previously reported “Bumblebe Cafe” which is located in the same building. Lucky Japanese fans will sure enjoy this event. Click on the bar to see all the mirrored images on this news post, and then sound off on the 2005 Boards! Pop Culture Shock continue with their 10-inch classic transformer line with another iconic character of our franchise. Via Pop Culture Shock Instagram account we have the full reveal of their new G1 Soundwave Statue. We have a very impressive cartoon-accurate rendition of Soundwave, with a beautiful cell-shading finishing. 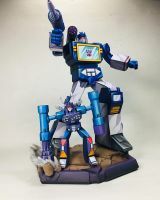 Soundwave is standing ready to fire his laser gun, and we have his cassette-bot partner Rumble shaking the ground by his side. A very fine piece for any collection. According to the information shared by Pop Culture Shock, pre-orders should be up soon, but we still have no concrete information on the price. Click on the bar to see the mirrored image on this news post and then sound off on the 2005 Boards! We saw the first prototype the the impressive Ultimetal UM-03 Megatron while back in 2014. It sure took time, but we finally have our first look at the final colored product of this impressive take on G1 Megatron. Direct from the C3AFA 2019 event, this impressive fully licensed piece is a huge, non-transforming representation of the ruthless Decepticon leader made with several die-cast parts, premium materials and an impressive metallic shiny finishing. This figure should be as tall as the previous Ultimetal Optimus Prime figure which was 17 inches (43.18 cm). Check the image attached to this news post and several videos showing off this great figure after the jump. Don’t forget to share your impressions on the 2005 Boards! 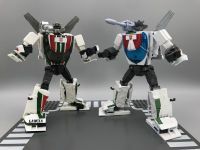 Courtesy of Alfes Blog we can share for you some great in-hand images of the next entry of the Masterpiece “Plus” series: MP-20+ Wheeljack Anime Colors. This re-release of Masterpiece Wheeljack carries on the trend of giving earlier Masterpieces a second run in more animation inspired decos. In Wheeljack’s case, we get a simpler and cleaner deco, with less details and logos as we saw him on the classic G1 cartoon. You can check out some key pictures after the jump (including comparisons images with the original MP-20 Wheeljack) and the full gallery here. Let us know your impressions on the 2005 Boards! 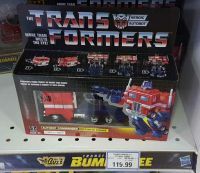 Sporting the import stickered proof of its travels, the trailer-less Autobot Commander Optimus Prime G1 Reissue is out at the City Square Mall Toys R Us location thanks to the recon of TFW2005 member lake88. Keep track of all the G1 releases here and remember to bring your sightings reports to the 2005 boards! 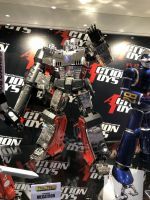 Courtesy of friend site Toyark.com we have some images of the Jada Toys display at the recent Toy Fair where we some new upcoming products were announced. Several of their non-transformable die-cast Transformers cars were shown (like G1 Optimus Prime and Transformers 2007 Optimus Prime in different scales), but there were some announcements that we are will catch your attention. First of all, a banner announced fully licensed 1:24 and 1:32 scale G1 Jazz and G1 Tracks. Both will include a collectible coin. Only placeholder images at the moment, but we are they will be great additions to any collection. For movie fans, a cool 1:24 and 1:32 Corvette Stingray concept Dark Of The Moon Sideswipe with collectible coin was also announced. To top it all, the Nano Hollywood Rides 3-Packs were on display. These tiny cars (only a few cm long) come in G1 or Movie packs. The G1 trio includes Bumblebee, Optimus Prime and Sideswipe and the G1 Movie trio is composed of The Last Knight Camaro Bumblebee, Age Of Extinction/The Last Knight Optimus Prime and Transformers 2007 Camaro Bumblebee.